Happy Monday! I know it’s been a while, but that’s about to change really soon as October will be an extremely life changing month for me (stay tuned for more). Not only is it a new fresh start to a week, but it’s a new month–October. As we enter October it’s such a pivotal time because it is the final quarter of the year. The last 3 months to perform at your highest level possible. It’s common to get excited about the holidays, chillier weather, etc. when this time comes around. It’s easy to opt to drop the ball on everything because you know that January 1st will allow you to press reset. My question is why wait? Why not prepare now so your fire is burning even hotter when 2019 hits? The key word in that statement is that it’s “common” for people to do that, meaning it’s typical. Following that mindset will land you with that familiar pattern of waiting until the new year, but if you’re really dedicated to leveling up in this next season then you need to plan now. One of my favorite quotes is, “If you fail to plan, you plan to fail.” Planning is so essential to goal setting because it is the starting foundation. Write it down, reach out to your resources. Use this quarter to set a plan so thorough that when 2019 hits you’ll be ten steps ahead of everyone else. Lastly, in this quarter it is important to guard your circle. If there are people in your life who aren’t aligning with the life you see for yourself in 2019 then don’t keep that energy around you any longer. It’ll only weigh you down and slow down your progress. 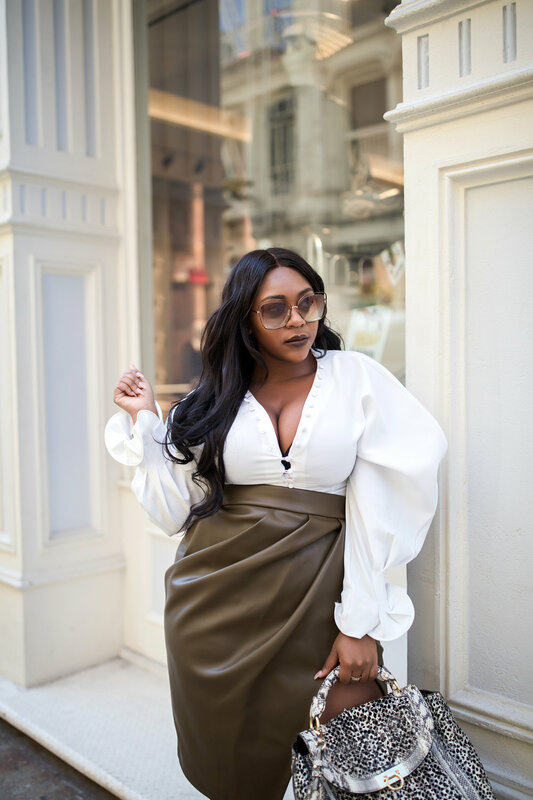 In these photos I’m stepping into this quarter wearing a puff sleeve top from The Kemist, a House of CB skirt (super stretch and fits over all this booty), Steve Madden sandals, a Ferragamo purse, Chloé shades, and my favorite bundles from Luxury Hair Closet which keep me looking fab!